Before you book your visit, you might want to take a look at the Migration Calendar, check with us regarding the current migration’s location – as this is a rough estimated migration’s location, based on current & previous year’s migration pattern. The reason why it is important to consider this calendar is simple: the migration consists of herds of wildebeest & zebras, gazelles, elands moving in a similar pattern (from Tanzania to Kenya, back to Tanzania) every year. The annual wildebeest migration of herds in Northern Tanzania and Kenya is one of the world’s most spectacular wildlife events. Often referred to as the ‘Greatest Show on Earth’, The Great Wildebeest Migration is a movement of approximately 1.5 million wildebeest and zebra throughout the Serengeti and Masai Mara ecosystems. December to March the Wildebeest migration congregates around Ndutu, in the far south of the Serengeti. April to May, the Wildebeest migration moves north into the plains of the central Serengeti. Between June and July the Wildebeest migration splits in two; one group goes West into the Western Corridor before crossing the Grumeti River, the other heads directly to the North of the Serengeti passing near Klein’s Camp. August to October the herd has reformed, and meanders on the Kenya and Tanzania border, along the banks of the mighty Mara River. Returning south from the beginning of November. 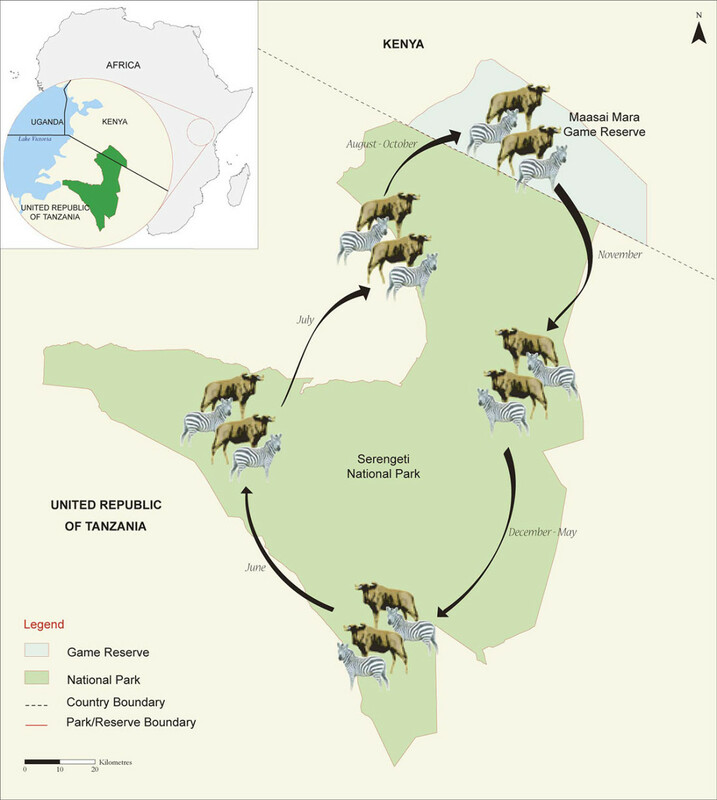 The path of The Wildebeest migration is dependent on rain. The animals move follows the path of the rain in order to feed off the new grass whilst also being close to a good water supply. Standing water may be found in different areas each year, may even be spread across different areas of the Serengeti. In the latter case, the herds may split and later regroup. It is worth checking your planned departure date against the routes taken by the herds in previous years. We have therefore written below a number of wildebeest migration reports for the various months, which may give you some idea of where to aim for!! Throughout this period, during the heavy rains, the animals have great opportunities to graze as grass is fresh and plentiful throughout the region. 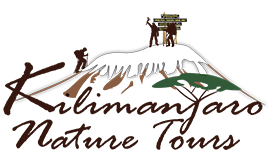 Many spread out throughout the entire Seronera region and further South to the Moru Kopjes. Early June 2005 saw brief spells of rain falling in the central and western areas of the Serengeti. Since there was plenty of green grass and standing water in the area the wildebeest were slow to move northwards. A few ‘leaders’ had made their way as far as Dutwa Plains in the Western Corridor (just South of the Grumeti River and CCA’s Grumeti River Camp) but the majority of the wildebeest migration was to be found around the Moru Kopjes (an area just South of the Serengeti Serena Lodge). The game viewing in Moru at this time was simply fantastic. In the last week there was a noticeable change with sizeable groups of animals starting to move into the eastern end of the Western corridor, with large concentrations in the Simiti, Musabi and Serena areas. There has been no real rain here now for a couple of weeks so the area is drying out some wildebeest have now reached the Grumeti area in the Western Corridor, waiting to start the first of the river crossings. Sizeable herds of zebra are already quite far north and have spread themselves between the Seronera, Lobo and Loliondo areas (ie the Central to Northern part of the Serengeti). A branch of the Wildebeest migration has been heading up through Loliondo northwards but the main bulk of the herds are still central. Overall (as to be expected, with lots of grazing and water) the wildebeest migration on the whole is still very spread out. The wildebeest migration towards the end of June was very spread out because of the good rains that occurred at the beginning of the month. Because of this, and the fact that there is plenty of good fresh grass the wildebeest migration is still very spread out over the central/west to Northern parts of the Serengeti. There are good sized herds both in the Western Corridor, and in the Bolagonja area (western and northern Serengeti respectively). The beginning of July saw the last of the large herds coming up from the south-east into the Western Corridor, around the Musabi and Simiti areas (the area just North of the Serengeti Serena and just below CCA’s Grumeti River Camp). Towards the end of the month there were still plenty of green areas in the park, but the standing water was drying up fast. The Grumeti River itself had stopped flowing although there were still plenty of good pools and watering holes along its length. Whilst the temperatures in the evening got quite chilly, the days were still generally very warm and pleasant. At the beginning of August the Kirawira area of the Western Corridor (located on the Grumeti River, around the CCA’s Grumeti River Camp) still has substantial groups of wildebeest around despite the fact that the area was drying up fast. There are still many hippo filled pools along the Grumeti itself but the river itself has stopped flowing and there is virtually no water left elsewhere. The Wildebeest migration has completely left the Moru area just south of the Serengeti Serena, though cats and elephant are still highlights of the area. (Resident game in the Seronera/Central region is superb throughout the year). There were light rain showers at the beginning of August right across the Northern Serengeti which stopped a large part of the Wildebeest migration from disappearing across the border into the Masai Mara. It also helped the fast regeneration of grass after the burning set by the park authorities. The wildebeest migration was still wide spread across the northern and north western Serengeti. There were no huge groups but sizeable crowds. Towards the end of the month the animals had reached the border and the herds were crossing into the Mara. After one of the longest rains on record, there were still some large wildebeest herds on the central and western plains of the Masai Mara with patchier herds towards the north of the reserve. The last two weeks were dry and hot, forcing the animals to converge at the larger watering holes or streams to drink during the day. The higher concentration of wildebeest on the central plains was largely due to the availability of grass; unlike other areas, these plains were not burned during the dry season, thus sparing the grass for the hungry herbivores. Sustained rain in central and western Serengeti through November and early December meant that the herds were well spread out in the central woodlands and on the western part of the Serengeti Plain. Moru Kopjes (an area just south of the Serengeti Serena Hotel) was the place to be, as game started to gather at the easternmost extent of the green grass. Then, mid December saw the first decent rainfall on the southern plains, and soon long lines of wildebeest and zebra were streaming out of the woodlands to cash in on the lush new-growth grass to be had there. The cows depend on this highly nutritious forage at this time of the year to see them through the late stages of pregnancy and to meet the demands placed on them after their calves are born. Rainfall was heavy at times (severe flash flooding of Olduvai Gorge caused long delays on the Ngorongoro / Naabi Hill track which is right in the South of the Serengeti), but evenly distributed, and the resulting widespread availability of quality grazing was reflected in the way the game was scattered widely over the plains; huge herds clustered in small areas close to water are a more dramatic sight, but often imply stress, as large numbers of game are forced to compete for scarce resources of food and water, which are, inevitably, rapidly depleted. December however proved different; driving across the short grass plains, near Gol Mountains for instance, the panoramic vistas were endlessly dotted with wildebeest, zebra, Thompson’s & Grant’s gazelle, and large herds of eland all munching happily. This state of affairs continued into early January, with periodic showers replenishing the grassland, and the herds continuing to make the most of this windfall.